The Best Bar Stools - Elegant with Comfortable Leather - Free Shipping! The Palermo Extra Tall Bar Stool by American Heritage offers a handsomely distinctive selection for your higher bar or counter. The Palermo Extra Tall Bar Stool features a metal frame with sleek gothic arches with a contrasting wooden top-rail. The tasteful metal base is supports an extra thick cushion which is upholstered in luxurious bonded leather. 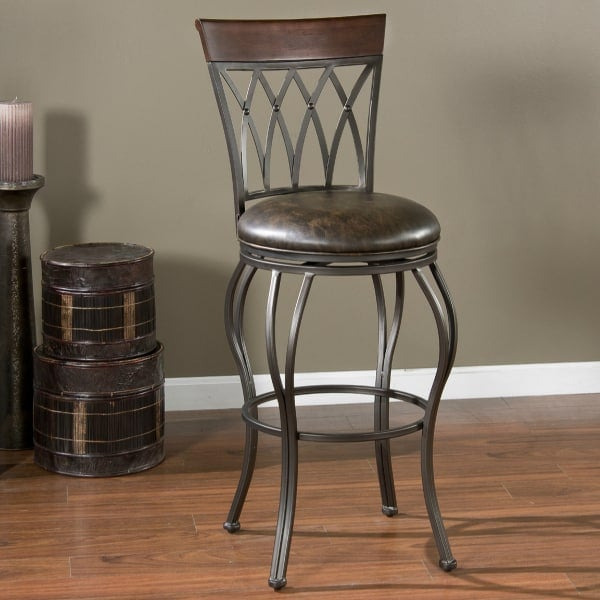 The Palermo Extra Tall Bar Stool is available in a pepper finish with a warm tobacco seat. It is user friendly, with a full-bearing 360 degree swivel function and convenient adjustable leg levelers.